Optimism and stay in a good mood – these are liked to show characteristics of Sagittarius ♐ – he is more enthusiastic and so he captivates friends and coevals by his interests and convictions. Therefore he is an idealist and maybe it is his part to do something – to do is by his own. Sometimes it appears, as if he is not enough emotional. But he has great ideas and it is in his part to realize and maybe save the world. 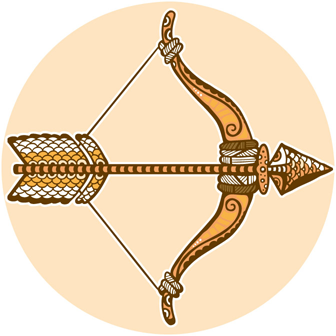 Sagittarius feels in a good mood when he travels and is confronted with strange and foreign situations – enriched and widens his mind and his horizon. But he is open-minded – generous he has a good heart - and he likes chasing after his dreams. Sagittarians are fond of travelling and therefore his strive of freedom and liberty must be shared and accepted by a partner. For Sagittarians it is an important point to have the same high intellectual standard within their relationships: for them it enriched and inspires their life in togetherness. Strenuous times are a challenge and a challenge is deep and profound love, but first their relationship based on confidence, equality and agility – like mobility and flexibility as well.